It does not matter how often I feel frustrated about the procrastination and lack of progress in Fremantle, something always happens that makes me realise why I love living here. The weekend was one of those. The energy at the Mucky Duck bush band dance was simply electrifying. It proves the Fremantle Society and its supporters are not a mob of stuffy boring old farts. It was also good to see, former Greens and now independent, Adele Carles being out and about and enjoying herself. She got more hugs that a baby’s teddy bear on the night, which shows there is still strong support for her. On Sunday I caught up at Rosy O’Grady with some members of the Fremantle Society to celebrate Estelle Blackburn’s Western Australian of the year award. Irish music, singalongs and dancing and plenty of Guinness made it a lot of fun. Good food and conversations at the Bengal afterward made it a perfect Sunday with delightful people. It is a fantastic and futuristic idea by Channel Ten to introduce fake spectators for the televised AFL Monday night games, but why stop there? Why not also introduce fake goals during low scoring games, or fake melees when games become boring. It might be an idea for the AFL to engage fakes expert MP Julie Bishop to come up with even bigger and better things, after all she has been faking intelligence for years in Canberra. I sincerely hope Channel Ten’s idea will be taken on by e.g. the Olympic Games organisers. Fake world records would be so inspiring. The real solution to the anticipated low spectator numbers would obviously be to have fake ticket fees. Let people into the grounds for free so you don’t have to digitally put fake ones in the stands. I know, that is far too simple. Has anyone tested Channel Ten and the AFL for drugs lately? Rio Tinto manager Tony Toledo is seeking Labor pre-selection for Fremantle, while being “100% behind the Barnett’s government bid to strip councils of planning authority”, while developer Australand had a huge win in the State Administrative Tribunal, and are now allowed to built wall to wall eight storey high seafront towers at Coogee Beach, against the wishes of the local community. This is indicative on how big developers work nowadays. They promise the world and once initial approval is given they change their plans, want to build more or higher, and far too often get away with it, because government departments will overrule local council decisions. That is a flaw that needs to be addressed, or we might as well all shut up and let the uncaring bureaucrats, who have limited knowledge of local community sentiments, rule our world for us. If we no longer have a say on how we want our communities to look than democracy is compromised. That is not acceptable and we will need to fight that! Should Labor be stupid enough to make Tony Toledo their candidate for Fremantle at the next election they have no hope in hell to win my vote back. Autumn cleaning is taking place in nature with leaves dropping all over. Homesick for Europe where that happens on a much larger scale. 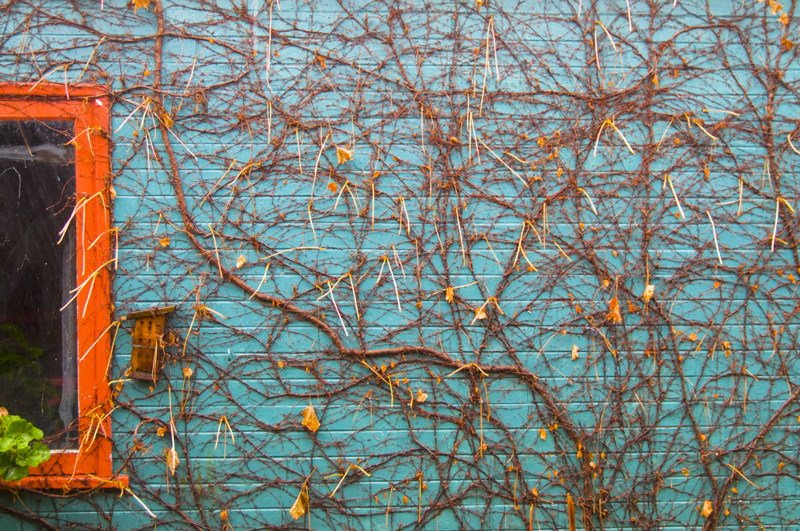 This wall at home is normally covered with vine leaves, now it is empty, which has created another beauty. I am almost ashamed to admit that I have never been to a council meeting, so last evening I decided it was time to yet again get rid of some of my ignorance and I finally went to the Town Hall. A mob of angry fishing folk attacked John Dowson’s stand on the fishing industry, but I liked that he compared the over-fishing with that of old growth logging. The simple fact is that neither are sustainable and logging of stunning old trees has basically come to an end. Over-fishing urgently needs to be addressed before it is too late. Sam Wainwright also made a valid point, when he talked about live sheep transport and nuclear free cities, that change has to come from council level. Only grassroots pressure will force politicians to change their mind. The tired tourist centre was yet again debated and I agree with John Dowson that something should be done urgently. At present it is in reality a travel agency that gets partly funded by the city. John’s idea of having colourful transportable satellite kiosks for tourist information is one I support. The idea of a permanent centre in the old toilet building opposite the railway station is also worth exploring. My first council meeting was a good experience and I was impressed with the professionalism of the dedicated councilors who give so much to our community. Thank you! The announcement that the City of Fremantle wants to create more retail space is a good one in principle, but one has to ask what the city and the Chamber of Commerce will be doing to attract quality retailers here, rather than more cheap 2 dollar or tourism related shops. Fremantle is in desperate need to get high quality retailers. There is one single good men’s clothing shop in town, but most of their gear is well outside my budget and that of most of my friends. The Myer shop is boring and insufficiently stocked, so we make trips to Garden City or Perth. 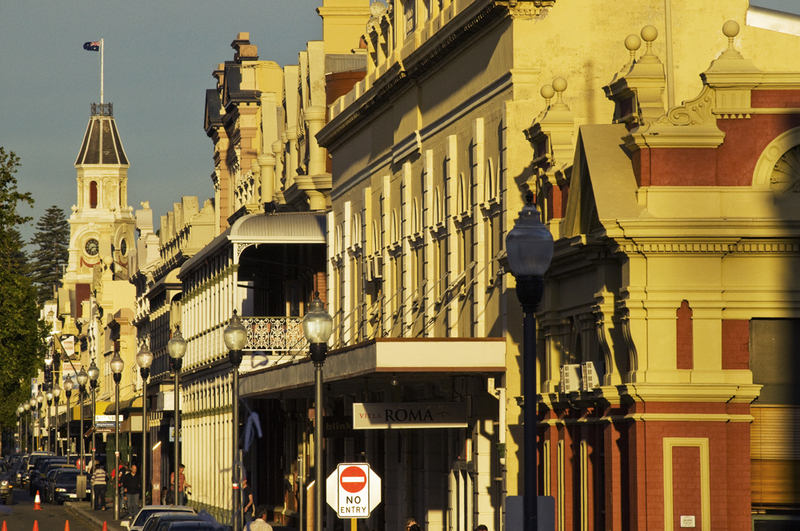 What Fremantle does not need is more average cafes and restaurants. We have got heaps of those but only a few good eating places. Fine dining only exists in George Street, in East Fremantle. The street is also a fine example of quality boutiques, a great bottle shop and the George Street Merchants. Fremantle has nothing like that unfortunately. So how will we attract franchises like for example Gazman, Rivers, ladies’ fashion, Harvey Norman or equivalent, a good butcher, bakery, pastry shop, etc. instead of Mac Donalds and trash shops? One of the problems I see in Fremantle is greed. It is very expensive to lease retail space (and it is similar trying to rent houses or units here). We watch time and time again people trying their heart out to make small shops work, but they are forced to close within months because of lack of trade and high rent. There are quite a few empty retail spaces in the city centre, but people are reluctant to open new shops because Fremantle is dead the first half of the week, and weekend only trade and sales is not sustainable for most. Cash flow is a must for small businesses, and even more so when one has to employ staff, who will need to be paid no matter if they make any sales on the day or not. And no one seems to care about the cruise liner trade. Why shops are closed on let’s say a Tuesday when a passenger ship with hundreds of potential customers arrives here is beyond me. Flexibility is the essence here! With Christmas only six months away it will only take that long for retailers in Fremantle to yet again be flabbergasted why there are so few shoppers in town while the shopping centres are bulging with them. Have a look at the bland mall, your uninspiring shop fronts, your often messy shops, and the stuff you sell and you have some of the answers. It would also be nice if your staff acknowledged when customers enter your shop, instead of staring at a computer or being pre-occupied with sending texts on their mobiles. Make us feel welcome! What Fremantle needs is to actively promote itself as an alternative to the sterile shopping centres and offer quality instead of quantity. We need great dining out venues and fantastic well-stocked stores in a pedestrian and parking friendly environment. That is the challenge for Fremantle. They sleep on the streets and under the stars and named their choir the Starlight Hotel Choir. 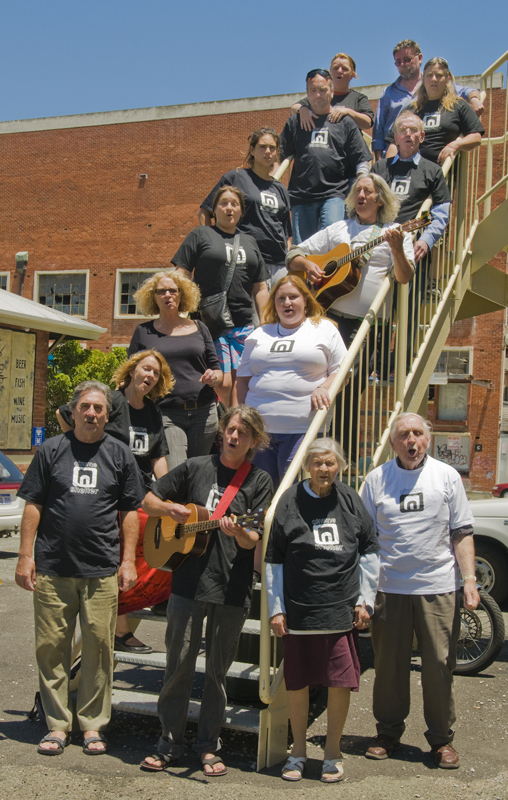 They are some of the homeless people of Fremantle, and on May 29 they will be singing at the Help The Homeless Art Auction that will be held from 5pm at the University of Notre Dame, on the corner of Croke and Mouat Streets. Some very good art by excellent artists will be for sale, so support this worthwhile event. After that come to the Town Hall for the Fremantle Society’s big bush dance night which starts at 7.30. # People who can’t make up their mind what to order at cafes while people are queuing behind them at the counter. # Selfish, racist, mean, rude and greedy people. # People who park their car a metre from the kerb so no one can get in or out behind them. # People who damage your car without leaving a note. # Women who stand at the supermarket check-out and wait till the final sum comes up before starting to search for their purse in the oversized handbag. # Fat people who ask me not to make them look fat when I photograph them. # People who lack courtesy and respect for other people. # Noisy cafes and restaurants. # People who believe they are better than others. # People who believe their religion is the only true one. # Car drivers who never stop for pedestrians. # Kids on busses and trains with feet on the seats forcing mature people to stand. # Bad food and bad service. # Politician who lie, or don’t keep their promises and policies. # TV news that starts with a sport item rather than important news. # Uncaring neighbours who have loud parties, or let their dogs bark day and night. # Self-important people with egos much larger than any of their abilities. I am sure there are plenty more things people get annoyed about, so let me know what you don’t like.